PALU, Indonesia — Brightly colored body bags were placed side-by-side in a freshly dug mass grave Monday, as a hard-hit Indonesian city began burying its dead from the devastating earthquake and tsunami that killed more than 840 people and left thousands homeless. 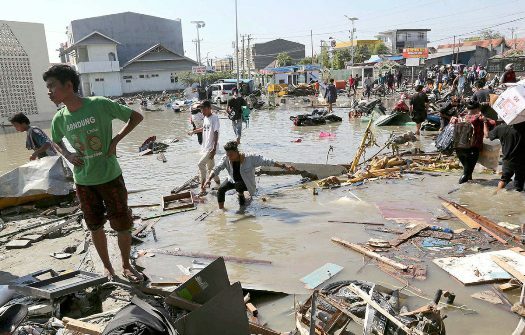 The death toll, largely from the city of Palu, is expected to keep rising as areas cut off by the damage are reached. The magnitude 7.5 earthquake struck at dusk Friday and generated a tsunami said to have been as high as 6 meters (20 feet) in places. Local army commander Tiopan Aritonang said 545 bodies would be brought to the grave from one hospital alone. The trench dug in Palu was 10 meters by 100 meters (33 feet by 330 feet) and can be enlarged if needed, said Willem Rampangilei, chief of Indonesia’s National Disaster Mitigation Agency. Local military spokesman Mohammad Thorir said the area adjacent to a public cemetery can hold 1,000 bodies. All of the victims, coming from local hospitals, have been photographed to help families locate where their relatives were buried. Video footage showed residents walking from body bag to body bag, opening the tops to check if they could identify faces. People suffering from a lack of food and supplies were also becoming more desperate. Local television said around 3,000 residents had flocked to the Palu airport trying to get out. Footage showed some people screaming in anger because they were not able to board departing military aircraft. The airport has resumed only some commercial flights. Indonesian President Joko “Jokowi” Widodo authorized the acceptance of international help, said disaster agency spokesman Sutopo Purwo Nugroho, adding that generators, heavy equipment and tents were among the items needed. He said the European Union and 10 countries have offered assistance, including the United States, Australia and China. Nugroho said conditions in the Balaroa section of Palu were particularly bad because the earthquake caused the ground to violently heave up and sink down in places, trapping many people under destroyed houses. In Petobo, another area of the city, the temblor caused loose, wet soil to liquefy, creating a thick, heavy mud that caused massive damage. “In Petobo, it is estimated that there are still hundreds of victims buried in mud material,” Nugroho said. Villagers who pulled out loved ones — alive and dead — over the weekend expressed frustration that it took rescue teams until Monday to reach Petobo. Edi Setiawan, 32, said he and fellow villagers were able to rescue five children and four adults, including a pregnant woman. However, his sister and father were not among them. But there were cases of survivors still being pulled from the rubble in different locations, including a 25-year-old woman found alive Sunday evening in the ruins of the Roa-Roa Hotel, according to the National Search and Rescue Agency, which released photos of her lying on a stretcher covered with a blanket. Novry Wullur, an officer from Indonesia’s search and rescue agency, said Nurul Istiharah, 15, managed to survive after being trapped inside her house after it collapsed. Her mother and niece were dead beside her, and water had left her submerged up to her neck and in danger of drowning. Her legs were finally freed and she was pulled out of the rubble. She was being treated for hypothermia at a hospital. The confirmed death toll of 844 released by Nugroho on Monday afternoon was an increase of only 12 since the previous day, with nearly the entire total from Palu. The regencies of Donggala, Sigi and Parigi Moutong — with a combined population of 1.2 million — had yet to be fully assessed. Nearly 50,000 people have been displaced from their homes in Palu alone, Nugroho said. He said 114 foreigners were in Palu and Donggala during the disaster. All were accounted for except one Belgian, one South Korean and six French. Palu, which has more than 380,000 people, was strewn with debris from the earthquake and tsunami. A heavily damaged mosque was half submerged and a shopping mall was reduced to a crumpled hulk. A large bridge with yellow arches collapsed. The city is built around a narrow bay that apparently magnified the force of the tsunami as the waves raced into the tight inlet. Nugroho said water was reported as high as 6 meters (20 feet) in some places.